Home/PRODUCTS/AUTOMOTIVE/AUTOMOTIVE PRODUCT RANGE/4WD'S, CARS, UTES & COMMERCIALS & BUSES/Suitable for TOYOTA/Suitable for LANDCRUISER UTE/Suitable for 70 SERIES RV, WORKMATE, GX, GXL - SINGLE CAB 10/1999 - 08/2016 (until the 2017 Upgrade). /BLACK DUCK SEAT COVERS - Driver Bucket & Passenger 3/4 Bench (3 seater) - suitable for LANDCRUISER SINGLE CAB HZJ79 & VDJ79, 70/79 series (from 10/1999 - 07/2009) (see description). BLACK DUCK SEAT COVERS - Driver Bucket & Passenger 3/4 Bench (3 seater) - suitable for LANDCRUISER SINGLE CAB HZJ79 & VDJ79, 70/79 series (from 10/1999 - 07/2009) (see description). Black Duck™ Canvas Seat Covers offer maximum protection to your seats and are suitable for Toyota Landcruiser Utes 79 Series HZJ79 - 70 Series VDJ79 - WORKMATE & GX - SINGLE CABS. Miller Canvas is a leading Online retailer of Black Duck Canvas products, we offer colour selection, a huge range & very competetive pricing! Your seat will have the best protection available. Black Duck Canvas or Denim Seat Covers. Over more than 20 years Black Duck Canvas Products has established a reputation for PREMIUM QUALITY - HEAVY DUTY seat covers and have developed a robust, well designed seat cover that will offer the best protection possible to your vehicle seats. Because of this reputation, Black Duck take their design, manufacturing and quality control measures very seriously. They have developed the best product available anywhere, for the protection of your seats. If you are not 100% satisfied with your Black Duck Seat Covers - suitable for Toyota Landcruiser's, we offer you a full money back guarantee*, because Black Duck have 100% confidence that their product will add value to your investment! 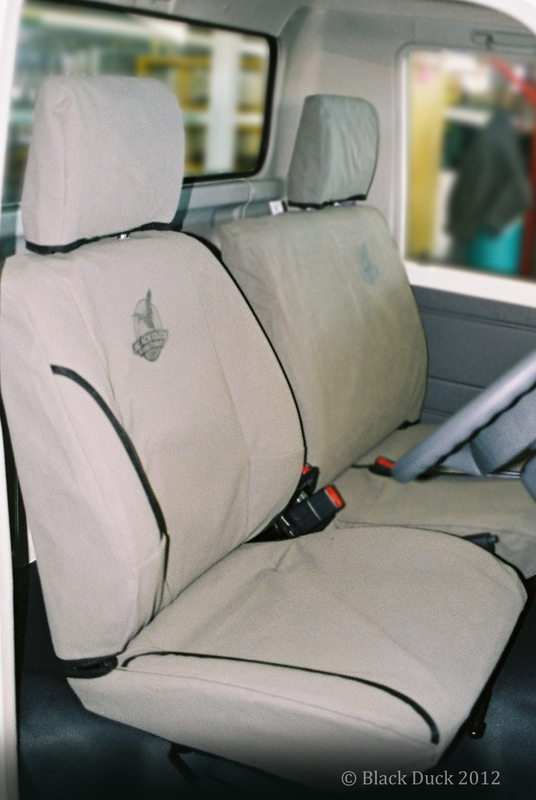 Max strength: The use of the right mix of Polyester (the strength component) means these seat covers have a very high strength rating and they are extremely durable and hard wearing and are suaitable for Toyota Landcruiser. Black Duck Seat Covers are custom patterned they add style, comfort and long-term protection for your seats and are suitable for Toyota Landcruiser Utes HZJ79, HDJ79, VDJ79, WORKMATE-GX-GXL & RV, SINGLE CABS 70 series. Make sure you fit Black Duck™ Seat covers suitable for 70 79 Series Landcruiser Single Cabs.